Nothing says autumn like a plaid button front shirt. Start with one great plaid shirt in cotton, flannel or even silk, and button it all the way up or leave open at the neck. From there, your layering and pairing options are endless. The plaid shirt offers a variety of looks, perfect for casual days at the office and laid-back brunches with friends. Try styling your plaid shirt by wearing it over, under and in-between existing pieces of clothing from your fall wardrobe. Throw on an unbuttoned plaid shirt cardigan-style over jeans and a tee for an easy layered look. Wear your plaid shirt under a pullover sweater. Layer your plaid flannel shirt under a puffy vest or a faux fur vest. A silk plaid shirt can go professional under a great blazer. Wear your plaid shirt open or partially buttoned over a tank. A plaid shirt under a cardigan is an effortless look. Sandwich your plaid shirt between a graphic t-shirt and your favorite black leather jacket. Aside from jeans, how many other pieces in your closet can you pair with your plaid shirt? Try these on for size. Tuck your plaid shirt into a skater skirt and add tights for a great winter look. A plaid shirt with leather leggings is right on trend. Tie an open plaid shirt around the waist over a summer sundress with thigh-high socks. Wear a short dress under an over-sized plaid shirt with tights and boots. Whether your style is a little bit country, a little bit rock ‘n roll or somewhere in between, the plaid shirt fits all aesthetics. Country – Your country look is easily accomplished with a flannel plaid shirt, faded jeans and boots. Preppy – For the classic preppy look, wear a cotton plaid shirt under a pullover sweater with the collar and cuffs popping out. Add cuffed jeans with moccasins or pumps. Girly – A silk plaid shirt with a pencil skirt will feminize your plaid for the office or date night. Urban Chic – Wear a plaid shirt-dress cinched at the waist with knee-high boots or wear a long plaid shirt-dress unbuttoned duster-style over jeans and a tee. For even more ways to get the most out of your favorite plaid shirt, follow the following styling tips. Accessorize your plaid shirt with a knit scarf and a beanie to stay warm or unbutton it at the neck and add a great bib-style necklace. Mix your plaid shirt with another pattern or print, such as leopard-print shoes. Tuck your plaid shirt into your jeans and add a colorful belt for a streamlined look. Pumps worn with jeans and a plaid shirt can take your look to a whole new level. Tie your plaid shirt around your waist over just about anything! You’re going to want to live in a plaid shirt this fall so plan to have at least two of this favorite seasonal staple in your wardrobe. 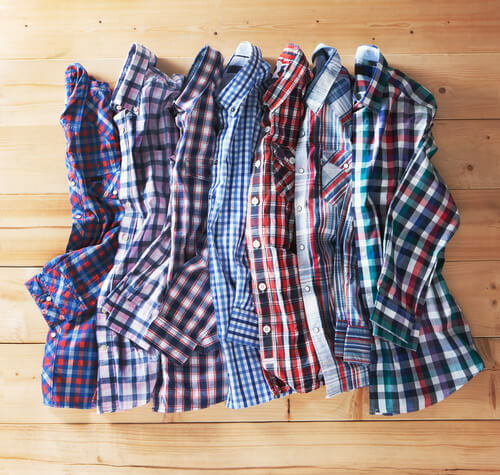 Opt for one in flannel and one in cotton.